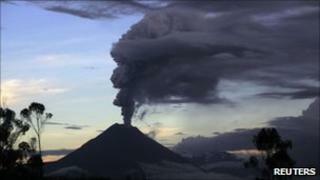 Ecuador has declared an amber alert after the Tungurahua volcano started spewing ash again. A plume more than 7km (4.3 miles) high could be seen emerging from the volcano in central Ecuador. The authorities evacuated residents living near the volcano's rim and ordered local schools to close. The Tungurahua has erupted periodically over the past 12 years, but this is its first significant activity this year. Monitors said they detected six eruptions, ranging from moderate to large. "According to our observations, damages to crops, pastures and small effects to the health of people are already evident," the Ecuadorean geophysics institute said.